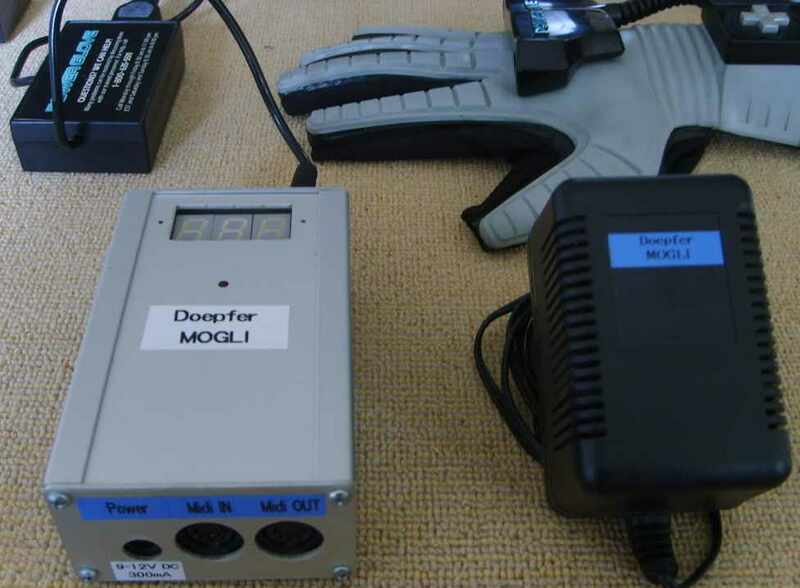 In 1993 Doepfer presented the Mogli MIDI Data Glove Controller, an alternative controller device that was based on a Nintendo Power Glove controller. It had traditional NES controller buttons on the forearm as well as a program button and buttons labeled 0-9. There were two ultrasonic speakers (transmitters) in the glove and you had to put three ultrasonic microphones (receivers) around your TV monitor. The ultrasonic speakers took turns transmitting a short burst (a few pulses) of 40 kHz sound and the system measured the time it took for the sound to reach the microphones. A triangulation calculation was performed to determine the X, Y, Z location of each of the two speakers, which specified the yaw and roll of the hand. It could also sense the bend of the individual fingers, the only dimension it couldn't calculate was the pitch of the hand, since the hand can pitch without moving the location of the two ultrasonic speakers. 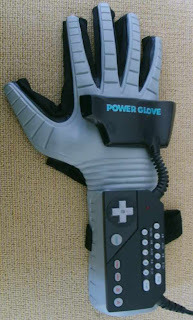 The Power Glove was originally released in 1989 and was in general a critical and commercial failure. In 1993 Doepfer introduced an external box that could receive the glove's data and convert it into MIDI signals. The original Mogli interface box was equipped with MIDI in and MIDI out, and it had a red 3-digit LED display. The display was needed to program the unit (i.e.to assign different function to the fingers, to the X/Y/Z coordinates, to the rotating angle and so on). After a calibrating procedure the glove could be used in different controller modes. The 'Virtual Play' mode was maybe the most attractive mode, in which could make you play a virtual keyboard in the free space. In Direct Mode you could assign any movement to any MIDI controller, other modes were Gesture Mode (converting sign-language to MIDI controllers) Vector Mode (position sensing only) and Manipulation Mode (for manipulating incoming MIDI with the glove). Although i am not the world's greatest electronics-guy i do have a feeling that the original Mogli converter box could be easily transformed into a version that sends Control Voltage and/or Gate signals. If you can find one, it will probably just work just fine with one of Doepfer's MIDI-to-CV modules, but you might not get the most out of all the glove's many functions. The price of the system was 598 DM (i.e. about 300 Euro) for the ready built unit including a Nintendo power glove. The kit version was 448 DM (i.e. about 225 Euro) incl. 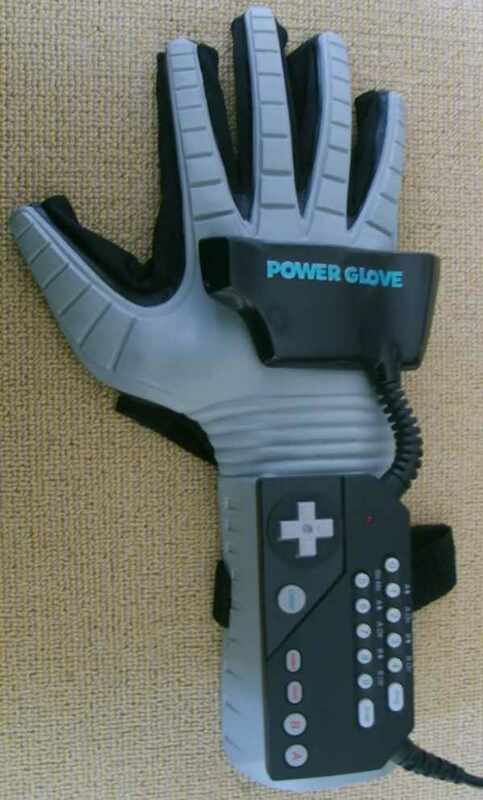 Nintendo power glove. 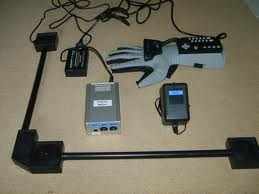 The unit was available from March 93 until December 1995, but Doepfer had to stop the production because the Nintendo Power Glove was no longer available. Around 350 units were made in total. Interesting fact is that the Mogli was also used by Kraftwerk (on 'Pocket Calculator' and 'Music Non Stop') during their concert at the Brucknerhaus in Linz/Austria on the occasion of the ARS Electronica Festival for Art, Technology and Society in 1993. Okay, i admit that the technology of the Power Glove might be outdated by now, but the idea of controlling sounds/patches with the move of your hand will always stay an interesting subject. Roland is famous for its D-Beam technology since 1998. The A-178 Theremin Control Voltage module (or the discontinued A-179 Light Controlled Voltage Source) definitely do not offer all the functionality of a glove like this. However, i do think we will see some kind of gesture-control-trend coming up this year with the recently announced Kinect motion sensing input device by Microsoft, that was already available for the X-Box platform but that will soon be available for the Windows platform too. Please let me know if you have an English version, or else check the start of my translation project (work in progress). A-143-2 Quad ADSR - Power to the Quads!